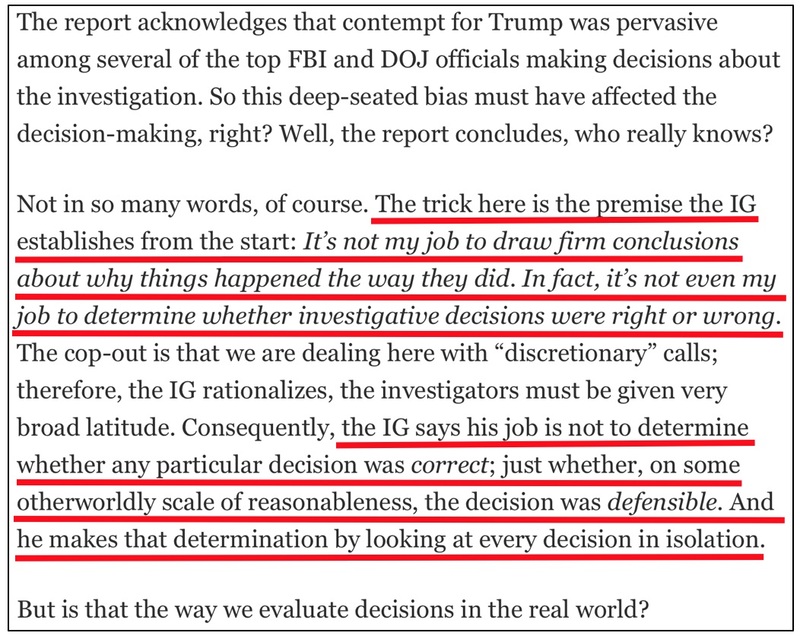 David Leonhardt's Friday New York Times column about President Donald Trump's reactions to the Inspector General's report on the FBI's and Department of Justice's pre-2016 general election actions is treating it as a blanket exoneration. Therefore, everything Presidential Donald Trump has said about it is a lie. The Times columnist began with a condescending "Trust me on this, you plebes" message to his readers, and went downhill from there. Well, it means that if you're the FBI, DOJ, and the establishment press defending them, you can pretend that the Clinton email investigation wasn't politically tainted. If you have the common sense to which McCarthy referred, you can't. "Federal investigators and prosecutors did not (ever) give preferential treatment to Clinton." "They (always) pursued the case on the merits." 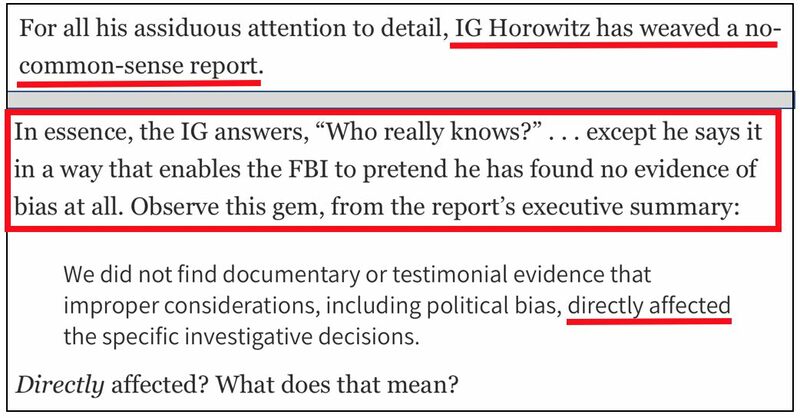 The IG report's content shows that Leonhardt's hysterical contentions are and always will be rubbish. Unfortunately for the Times columnist, this isn't the 1960s, where a nearly monopolized press could tell a public which doesn't have access to the same information they did what a report said, and could interpret and spin with virtual impunity. 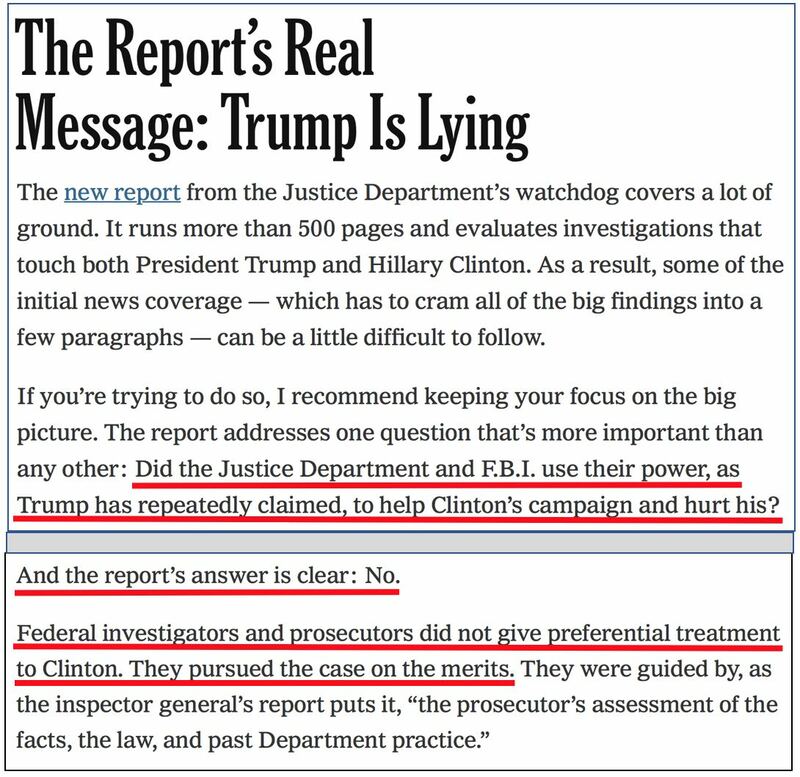 "The FBI went rogue during the last election, believing the reins of power were its to convey, and all you get from the objective report of its activities is that Trump is lying?" "You continue to write with such a heavily slanted and exaggerated bias that it is becoming silly." "Mr. Leonhardt can provide sustenance to the anti-Trump ‘resistance’ all he wants but ignoring Mrs. Clinton’s own well-documented aversion to honesty destroys his own credibility." Blaming President Trump here is merely a diversion to distract from the larger truth. The Obama DOJ & FBI failed the public miserably in their conduct. J. Edgar Hoover would be proud. The rest of us should be disgusted. Finally, consistent with how the rest of the press is handling the matter, Leonhardt never brought up former President Barack Obama. The IG report demonstrated that Obama lied when he claimed that he learned about Hillary Clinton's private server use "through news reports." All of this is consistent with Leonhardt's long history of hard-left, ignorant commentary.